Journeying through years of infertility, we read through every “how to get pregnant” book we could get our hands on. So many anecdotal “tips and tricks” abounded on message boards and in conversation, but would just send us roller-coasting from hope to disappointment each month. Doctors diagnosed us with “male factor infertility,” but then when I got pregnant and miscarried a couple of times, it was labeled “unexplained infertility.” We continued our dream of pursuing adoption (something we had hoped for whether or not we were blessed with biological children), while still learning about new healthy life choices. After 2 years with our sweet little girl, and were beginning to consider life as “just the three of us,” we were blessed to find out that I was pregnant again. When I announced our pregnancy, I received quite a few inquiries regarding any information that may have “helped” us become pregnant. One of the reasons I have hesitated to write such an answer is that I believe our fertility is ultimately in God’s hands. Repeatedly throughout the Bible, we see God’s hand putting families together in many different ways- which has often included infertility! However, pursuing good physical and spiritual health is important in being good stewards of the bodies and resources God has given us, and can help provide a healthy foundation for Him to place a new, growing little life. We both decided to start taking “natural” multivitamins, to fill any potential “gaps” in our nutrition. During various seasons, my husband especially focused on taking at least a zinc supplement (and eating foods rich in zinc), and pycnogenol or grapeseed extract (both antioxidants reputed to possibly help sperm health). 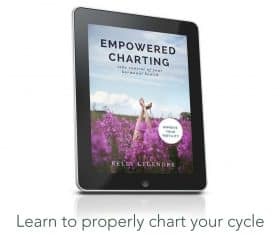 When I noticed my once long- but predictable- cycles becoming irregular and more uncomfortable, I was able to help regulate my cycles with Evening Primrose Oil for the first 2 weeks of my cycle (I did this for about 3 months). After spending years as vegetarians, we began adding some naturally/humanely-grown meats to our diet. We switched from non-fat dairy products to drinking whole raw milk and eating hormone-free whole-fat dairy products (yogurt, cheeses, etc). Our previous vegetarian diet had been very high in soy (TVP, tofu, etc.). At one point, as we increased the soy products in our meals in an attempt to save money, we noticed a significant decline in our health. We eventually eliminated soy from our meals, except for an occasional dash of tamari in a stir-fry. We eliminated canola oil, in favor of “healthy fats” such as coconut oil, and the butter made from raw milk. I began following the “Brewer Diet” as a way to help make sure I was actually eating enough nutrients to support a pregnancy. We added cultured items to our diet (such as kefir and lacto-fermented vegetables). We eliminated sources of MSG and other additives/preservatives in our foods and started using real sea salt and herbs as seasonings. I began regular forms of exercise, with walks outdoors a couple mornings a week, along with yoga or pilates one or two evenings a week at home. I pushed our daughter in a stroller for our walks. I didn’t have a need for weight loss, so my yoga/pilates routines focused on a combination of strength, stretching, and relaxation. I have noticed that my body has always responded to the concept of “lunaception“. This may not necessarily be a “proven concept”, but I did notice a difference. Plus, our rest was definitely better once we put up some dark curtains! Focusing on eliminating a constant state of stress was a significant challenge. I had come from high-stress work environments to being a stay-at-home mom, and my body took a while to stop being in an ongoing “adrenaline state!” The relaxation exercises, along with restful baths, occasional naps, and regular prayer times really helped. God began to teach me more about relinquishing my fertility to Him, as Lord of my life. 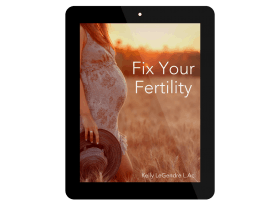 Instead of trying to “control” it myself, and being “addicted” to all the fertility message boards and latest fertility publications, I needed to place the control in His hands. In response, I gave up all fertility-related reading (online and print) for a season of Lent. This added such a new peace to our situation- and by the end, I had no desire to go back! We were encouraged by reading Mary Pride’s book “All The Way Home,” (available on Amazon) as she has wonderfully written on healthy marital intimacy and fertility. It provided a much-needed Biblical focus for that season of our lives. God began to teach me more about His love for me, as His beautiful creation. Instead of being ashamed or frustrated by my body/infertility, I began to prayerfully embrace His work in my life. I chose to embrace the season God had placed us in and chose to be content… I knew that even if God blessed us with more children in the future, I didn’t want to be stuck in the “debilitating” spiritual state of always wanting more. We would love to see God grow our family, but believe that a contentment in His provision is so important in every area of life- not just with fertility. We can embrace His blessings, without allowing our desires to be consuming, and taking His place of headship in our lives. In our world full of electronics, we began taking a closer look. The cell phone came out of the front pocket of my husband’s jeans and was placed in his bag. The laptop computer stayed on the table- not on our laps! We gave away our microwave and got a $5 toaster oven (both on craigslist). You took the time to email me a few months back and I never responded because life got overwhelming, but I wanted to let you know that I took a lot of your advice. This morning I found out that I'm pregnant and I did it with God's grace, real food, and no metformin, despite PCOS. I'm inspired to give up sugar, Michele, after reading this. Not that I want to quit, I just want to stop wanting it!! The spirit is willing…. I've been thinking about using evening primrose oil to see if it help with my cycles as well as excema. Do you have a brand you recommend? I just used the Trader's Joe's brand Evening Primrose Oil. Great post, Michele! I agree so much about the aspect of placing your fertility in the Lord's hands, trusting His ultimate timing and plans for our families. Great article, I've been walking the same path 🙂 I definitely noticed that I get crazy at a store setting with all the artificial smells of people, gosh it brings tears to my eyes walking from one perfume cloud to the next!! If these people pet my dogs I take that smell home and my dogs smell like other people's perfume for hours…. I have been entirely without refined sugar (or ANYthing that contains it) for about 2 years now and my brain still tells me it wants it. Hubby is a pastry king… each time I pass the container with the sugar topped pastry my brain says oh yumm! and I KNOW I don't even like them. I tried, disgusting LOL… I am still waiting for physically not wanting them. Michelle I LOVED this post. A week or two ago you left a comment on my blog. We have struggled with infertility, had a baby, struggled with infertility and are now adopting. I also believe our fertility is ultimately in God's hands. Thank you for being such an uplifting example to me! After 9 years of infertility we find ourselves expecting our first miracle in June. We adopted five children in 2006 and have been just living life, believing that God would bless us one day. I too have changed our diet a lot. I was diagnosed with type 2 Diabetes and PCOS a few years ago. This is a wonderful post with lots of great ideas. Cutting back on Carbs and Sugar went a long way to improving our health and I believe God planting the blessing wihin me. I found out recently that high blood sugar inhibits fertility by creating a hostile enviroment. We have been on the real, traditional foods journey as well. Not so much for infertility reasons, but to be good stewards of our health/body. Thank you so much for posting this. This has been an 100% summation of what I’ve been researching lately. Even down to giving our desire/fertility over to God. I plan on printing this out, praying over it asking God what’s first, and go from there! PS, also I am beginning to think I have gluten issues. I have a few people in my family that have gluten problems. GREAT information on gluten, celiac, and silent celiac! Just found this website today and I find it so inspiring. My husband and I have been trying to conceive for quite some time now. I am just now realizing we have to give it over to God and give up the control we never had in the first place. Thank you for this blog!!! !